Stuart Hampshire, one of the most eminent British philosophers of the twentieth century, will be perhaps best remembered for his work on the seventeenth-century philosopher Spinoza, all of which is gathered now in this volume. Among the great thinkers of modern times, only Spinoza created a complete system of philosophy that rivals Plato's. Few other thinkers have felt so strongly 'the desire to have a unitary view of the world and of man's place within it' - adesire that led Spinoza to make crucial contributions to every major philosophical topic: the nature of knowledge and freedom, the existence of God, ethics and politics, mind and matter, pleasure and perception. 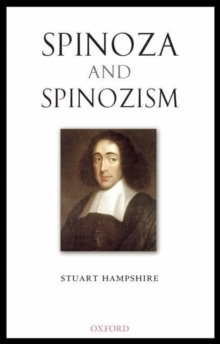 Hampshire's classic 1951 introductory book Spinoza pioneered the revival of interest in him in the English-speaking world. It remains the best introduction, and it is reprinted here in its revised edition. But what gives particular interest to this new volume is the first publication of Hampshire's last work 'Spinoza and Spinozism', an extended presentation of a Spinozist philosophical worldview. To complete the picture, Hampshire's influential 1962 essay 'Spinoza and the Idea ofFreedom' is also included. Spinoza and Spinozism is thus an ideal companion to the study and interpretation of this great philosopher.